In this issue: Daniela Torsh introduces us to Doris, an unlikely shepherdess, and recounts a unique love story that spanned continents and cultures, between her father’s cousin, who fled from Vienna to rural England, and an Austrian banker shipped to Australia on the Dunera. We meet Bram Presser, winner of three awards at this years NSW Premier’s Literary Awards for his novel The Book of Dirt, a semi-fictional exploration of his grandparent’s story. 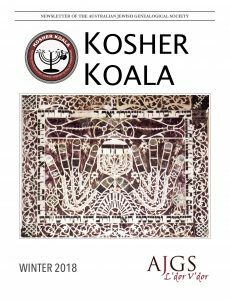 And we get a quick look at the IAJGS conference, which has just wrapped up in Warsaw.